Wanted to go as "green" as possible in this project by creating the main design elements from reclaimed and recycled materials. An Old Blacksmith's Workshop, abandoned and turned down by time, only to be given birth again many years later as a FireWood Oven and grill restaurant. 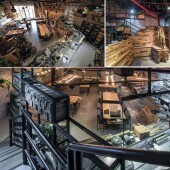 Built Almost entirely from reclaimed materials, FoodSmith restaurant in TajMall - Amman reflects what can be achieved when given the freedom to design without much client intervention. For this project, we've designed everything from Concept, to interior and Brand. 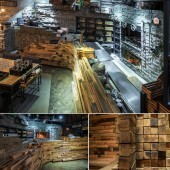 People are constantly struck by the ambiance and cannot believe that this restaurant decor was made almost entirely from waste products and reclaimed materials. Needless to say, the photos don't do the place enough Justice. Restaurant is 150sqm on the Ground Floor, with the Kitchen and services upstairs covering 70 sqm. 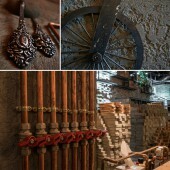 Recycled and reclaimed materials that were gathered were namely: Copper piping, cement brick tiles, and lots and lots of reclaimed wood in different shapes and sizes. The concepts were then designed as clusters by the Architect and computer visualization software was used to visualize the ideas and provide a step-by-step building reference for the builders on site. Though the final design seems orderly chaotic in nature, every brick, plank and pipe was carefully orchestrated and manifested through detailed construction drawings. The challenge here was to reincarnate all the reclaimed material to produce something not only functional, but pleasing and enticing as well. The Brand we created for FoodSmith revolves around the following description: A Smithy is a person who works in a metal workshop by heating, hammering and welding metals to form usable tools. This is where the Blacksmith, Silversmith, goldsmith, locksmith, arrowsmith etc.. names hail from. The idea behind the brand in relation to the space is to experience a Smithies workmanship. Hence giving just to the over use of copper, exposed rough walls, high fire, coal and smokey aura. Even the idea of the open kitchen utilising the brick oven manifests audio and visually the story of Foodsmith. The space too has comfortably yet eloquently gone over board with its roughness, rawness and exposure of these materials. This highly communicates the style the food is being served in. The visual communication uses emblematic graphics but in an authentic and rustic manner. Since the our design concept is about rawness, it is also about the rawness and freshness of the food. How food is being manipulated by the fire, in the oven and the open kitchen. Ergo the graphics carry old and intricate mechanical objects superimposing the softer fruits and vegetable foods. 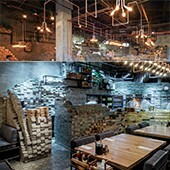 Foodsmith-Firewood Oven & Grill Firewood Oven & Grill Restaurant by Abidi Wa Hakki-Two Opposites Design is a Nominee in Interior Space and Exhibition Design Category. · Click here to register today inorder to be able to view the profile and other works by ABIDI wa HAKKI - Two Opposites Design when results are announced. 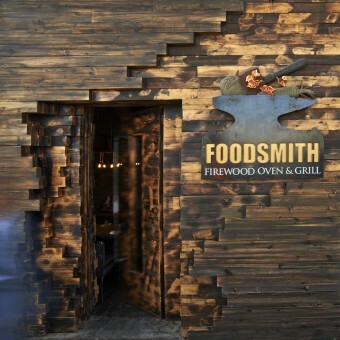 Foodsmith-Firewood Oven & Grill Firewood Oven & Grill Restaurant by Abidi Wa Hakki-Two Opposites Design is Winner in Interior Space and Exhibition Design Category, 2014 - 2015. · Press Members: Login or Register to request an exclusive interview with ABIDI wa HAKKI - Two Opposites Design. · Click here to register inorder to view the profile and other works by ABIDI wa HAKKI - Two Opposites Design. Did you like Abidi Wa Hakki-Two Opposites Design's Interior Design? 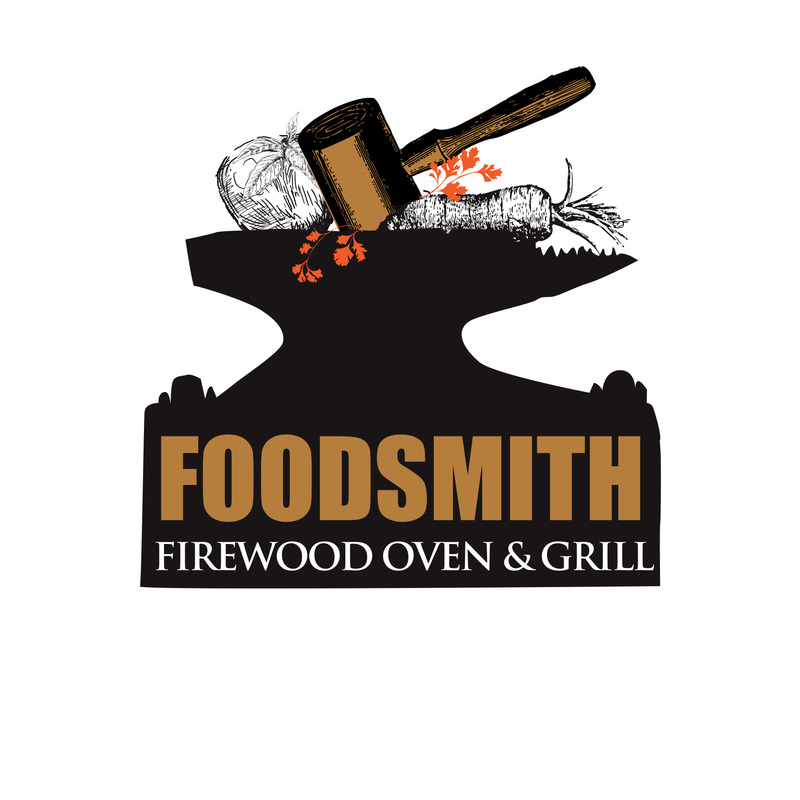 Did you like Foodsmith-Firewood Oven & Grill Firewood Oven & Grill Restaurant? Help us create a global awareness for good interior design worldwide. Show your support for Abidi Wa Hakki-Two Opposites Design, the creator of great interior design by gifting them a nomination ticket so that we could promote more of their great interior designs.